The UK's 314th Woolworths opened on Roman Road in the second half of the 1920s. It still has the Woolworths 'look' about it, a symmetrical building with offices above and a central flourish for the brand name on top. In its final days it was a Woolworths Local - a slightly slimmed-down Aladdin's Cave of retail titbits - and also Roman Road's most important single store. 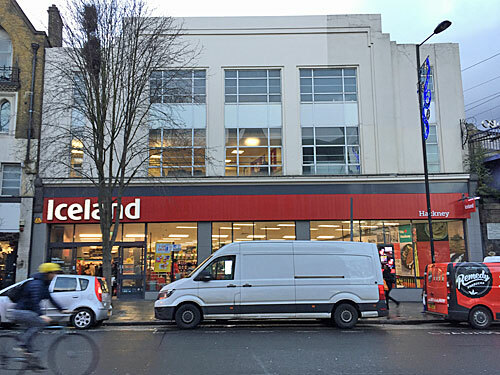 Iceland promptly snapped it up, there being no other supermarket in the vicinity, and are still holding their own against the new Tesco round the corner. Poplar's Woolworths must have opened shortly before Bow's, because its Woolworths store number is 302. The very concrete-y design confirms this isn't the original location, but part of the 1950s Chrisp Street development on the Lansbury Estate. Again it was the most important single store, a good foil to the market further down the arcade, but was a bit gloomy inside. It too has become an Iceland, but lovers of assorted gifts and homewares needn't worry because a glittering selection is available at Best Sellers (Quality Goods at Reasonable Prices) a few doors up. This one's postwar, and looks it, with Bethnal Green not earning its own Woolworths until the late 1950s. 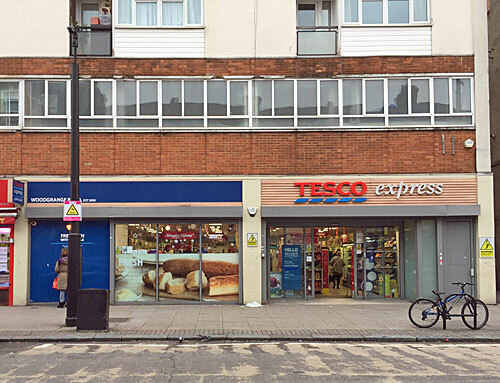 It became store number 993, slotted in towards the tube station end of Bethnal Green Road, which is now dominated by an enormous Tesco. 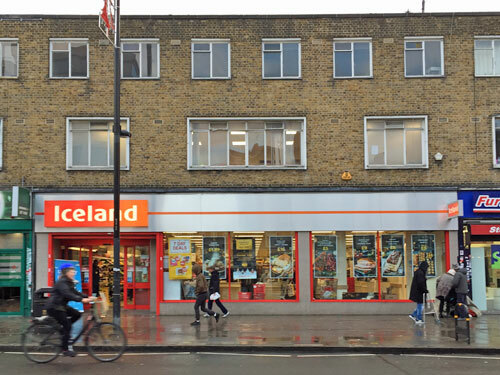 Unexpectedly, it seems every former Woolworths in Tower Hamlets has become an Iceland supermarket, almost as the administrators did some kind of job lot deal. This one's now slotted in between a betting shop and a furniture store, if you're popping down. 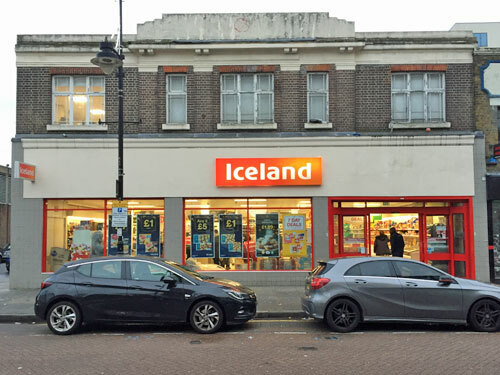 Meanwhile in Hackney, what do you know, another Iceland. It's store number 2003 on the Woolworths list, which is odd because it looks classically Woolworths from the first floor up. 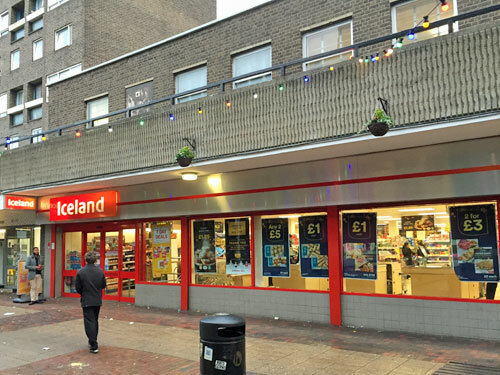 But at ground level Iceland have done their usual revamp, replacing all the former frontage with glass and shifting the entrance to one side. They must have been delighted to nab a prime spot like this, located immediately alongside the railway bridge (rather than up the Narroway with the former BHS and the can't be long-for-this-world M&S). At least it's not an Iceland this time. Stratford's Woolworths opened in 1920, becoming store number 86 and hence the earliest on my list. Its original location was on the Broadway, but when the Stratford Centre came along and demolished that side of the road it moved inside. It was probably the Woolworths I used most, a long cluttered cavern dispensing stationery, saucepans and pick'n'mix to an undiscerning audience. 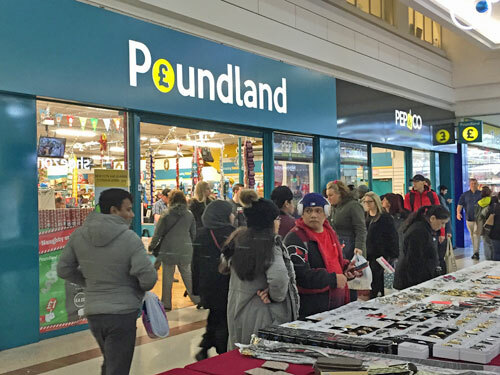 Poundland's one of the closest existing chains to the original Woollies philosophy, just much cheaper, which'll be why their tills are still ringing. East Ham's high street is Newham's second busiest, after Stratford, and still a pretty decent place to shop. Woolworths store number 127 opened in the early 1920s, serving a fast-growing population, originally at 193 High Street. But it was destroyed on the first night of the Blitz, and a replacement was built later on the corner of Skeffington Road with a touch of Fifties Moderne about it. 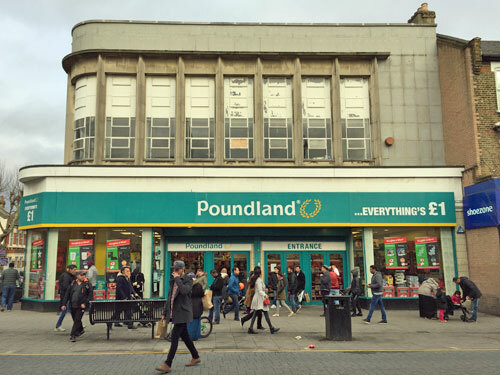 Today's it's another Poundland, the third such ex-Woollies conversion in the borough of Newham, and buzzing with local bargainseekers. A former Woolworths is a good indicator of a formerly important high street, and Forest Gate's still has traces. But tesco never had a foothold here until store number 1017 closed down, a medium sized unit ideally suited to supermarketisation. Confirmation of re-opening is given on the blue strip across the top of the window, where it says "Woodgrange Road Est 2009" just above the cashpoint. The Co-Op and Iceland also have outlets close by, but a sign that all is not well is the imminent demolition of a dozen shops between Papa's Chicken and Barry's Meat Market. Woolworths store number 530 opened in Leytonstone in the early 1930s, but this isn't it. This is a 1954 rebuild, with a public library on the top floor, but still approximately Woolworthsy in its architecture. 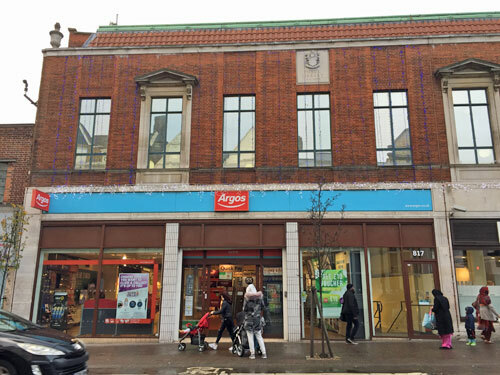 To add a bit of variety to my list it's become an Argos, rather than the more usual pound shop or supermarket. The only other catalogue outlet in Waltham Forest ten years ago was in Walthamstow, so they snapped up the shell, and people have been queueing at Collection point A ever since. Of course there was a Woolworths in Barking, opened in the same early 1920s burst as Bow and Poplar. It was located in what's now the quieter half of East Street, the end the market doesn't reach any more. The reason it's not an Iceland or a Poundland is that those two businesses are located on the opposite side of the road, and so it became a sub-pound store instead. Sam 99p (Yes! 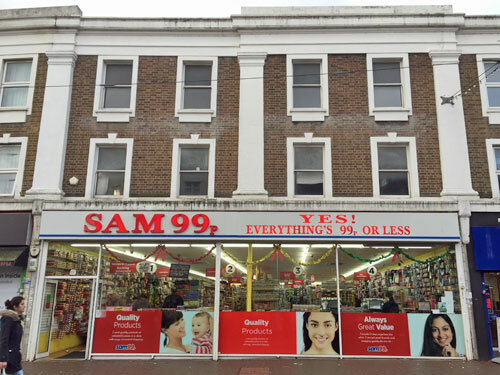 Everything's 99p Or Less) is an Ilford-based chain selling discount homewares, DIY kit, groceries and party goods, which sounds very much like a 21st century Woolworths, only cheaper. And finally, something completely different. The Big W was Woolworths warehouse brand, a chain of 21 outlets located on retail parks incorporating goods from Superdrug, Comet and B&Q. 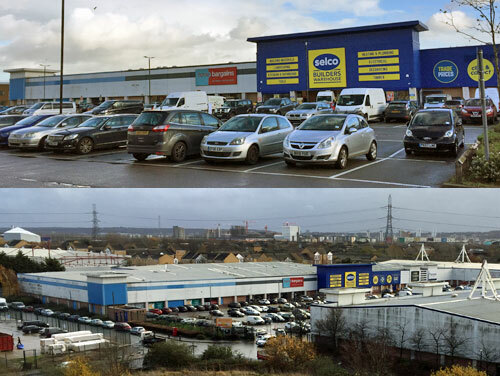 Beckton's Big W opened in 2002 as the mainstay of the Beckton Retail Park, a car-friendly enclave at the foot of Beckton Alps (which is still the best place from which to see it). The main chunk of the former store is now occupied by a builders warehouse, serving the white van trade, while to either side are a lowbrow homewares store and a popular Eastern European food emporium. But an extensive portion at the northern end is now vacant after Poundland (them again) relocated to the busier Gallions Reach Shopping Park, and rather fewer people now park over that side. It feels like Woolworths overreached themselves here, as they eventually did overall, but generally speaking others have swept in to fill the space with something better focused, and they trade on, for now.